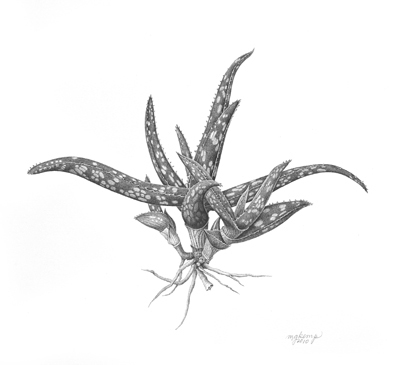 Martha G. Kemp, who specializes in the use of graphite pencil for her botanical artwork, has exhibited widely in the United States in juried and invitational shows and has received numerous awards, including the American Society of Botanical Artists (ASBA) 1999 annual “Award for Excellence in Botanical Art,” the Ursus Rare Books and Prints “Award of Excellence“ at the ASBA/Horticultural Society of New York’s Fourth Annual International Juried Exhibition in September 2001, “Best Drawing in Show” at the ASBA/HSNY’s Sixth Annual International Juried Exhibition in September 2003 in New York City, and The ASBA Award at the September 2010 ASBA/HSNY 13th Annual International Juried Exhibition. She has exhibited six times in London at the Royal Horticultural Society’s Westminster shows, where she has been awarded one Silver-Gilt Medal and five Gold Medals, most recently in November 2007. She served on the ASBA’s Board of Directors from 1999 until 2005 and began serving a new term in 2008. Her work is in the permanent collection of the Hunt Institute for Botanical Documentation at Carnegie Mellon University, the Brooklyn Botanic Garden Florilegium, Garden Club of America headquarters in NYC, the Alisa and Isaac Sutton Collection in New York, and the Shirley Sherwood Collection in London. She is represented by Susan Frei Nathan in New Jersey and her work can be viewed online at Sfnbotanicalart.com.